Subject: Prayers to bring about amicable solution to the protracted Indo-Naga political problems at the earliest possible time. 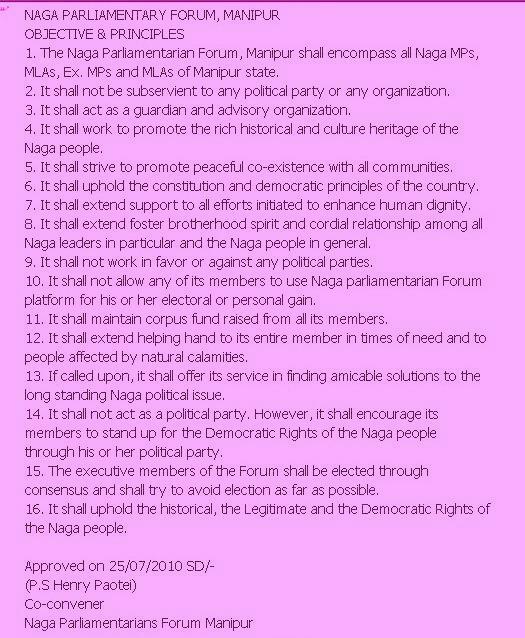 We, the undersigned, the Naga Parliamentarians comprising of both sitting and former MPs and MLAs from the state of Manipur bring special greeting from our people to you and your government. At the outset, it would be wrong on our part if we do not acknowledge the sincere commitment of the successive honourable Prime Ministers starting from Late Shri PV Narasimha Rao, Shri Deve Gowda, Shri IK Gujaral, Shri Atal Bihari Vajpayee and presently your honour towards finding an amicable solution to the protracted Naga problems. The peace negotiation between the Government of India and the NSCN-IM has entered fifteen years (1997-2012). However, no amicable solution could be hammered out till date. Nonetheless, we are extremely happy to learn that considerable progress had been made in narrowing down the difference and both the parties are arriving towards an amicable solution. Sir, we have seen enough suffering and agonies of the Naga in our respective constituencies due to the prolonged armed Naga movement. We are fully convinced that, until an honourable negotiated solution is found, the Naga areas will remain ever same with backward and isolated in all the years to come. Sir, peace is prerequisite to meaningful and speedy development. Without peace meaningful development cannot take place in any area. It is our ardent desire to have peace in the trouble torn North East India. We are committed to peace and we fully support the on-going peace talk between the Government of India and the NSCN-IM as it is based on the ‘unique history’ and ‘situation of the Nagas’. We, therefore, urge your honour to exercise your political will to address the core issues for permanent and honourable solution at the earliest possible time.